Thanks Brad, great post and a timely refresher. Thank for the clear and very understandable details about the lifecycle of a Sql Server log file. It is rare to see such a complex subject explained in such a helpful manner. 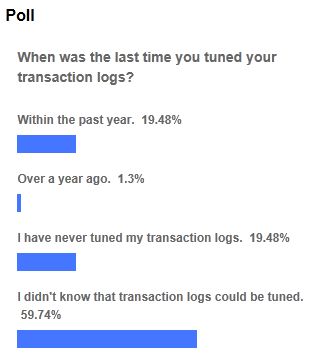 Um, probably a stupid question, but how can you tell if the transaction logs are being tuned or not? Randall, download the presentation mentioned in my post, and if what I describe has not been done, then your transaction logs have not been tuned. Amazing presentation with very detailed information about the log internals explained in a directly-to-the-point way! Thank you for the dedication in writing it. The topic of transaction log tuning has been explained so brilliantly. Excellent work, Brad. Thanks for benefiting the SQL Server community with your wealth of knowledge.